WINFIELD – A Putnam County funeral home facing its own legal issues has filed a lawsuit against another funeral home and some family trusts for “tortuous interference with an advantageous business relationship,” interference with a contract and civil conspiracy. Chad Harding and Gatens-Harding Funeral Home filed a lawsuit June 3 against Leonard Johnson Funeral Home and owner Mack Johnson. Also listed as defendants are The Joseph M. Gatens Family Trust and Joseph M. Gatens Marital Trust. Michael and Joseph Gatens are named as the trustees, and they are named individually as well. In his complaint, Harding says Johnson contacted his attorney in January seeking to buy the funeral home. Harding says he declined the offer. But he says he received a letter dated Jan. 28 from Johnson saying Leonard Johnson Funeral Home Inc. was the purchaser and successor in interests to the trustees of the Family and Marital Trusts under the will of Joseph M. Gatens Jr., Jane G. Vaughan and Dreama Rose Gatens. Before the Jan. 28 letter, Harding says Johnson had not advised him of any negotiations, contacts or agreements he had with the trustees, escrow agents or others regarding the purchase of the funeral home. Harding also says he disputed that promissory notes were in default, he demanded information showing such facts and he offered to pay the amounts of the promissory notes. “Defendants have not permitted and continue in their failure to permit the plaintiff to pay any amounts due under the contracts and regardless of to whom the same may be payable under any theory of ownership thereof,” Harding writes in his complaint. It says Johnson issued a notice in March saying he planned a meeting to select a managing member and/or funeral home director and to discuss future management of the company. Believing Johnson had no authority to do so, Harding filed a petition for temporary injunctive relief in Putnam County and, because of that, he says Johnson must be prohibited from proceeding with the meeting and business plans. “The ill and malicious intent and desire of the defendant Mack Johnson and LJFH to improperly, wrongfully, and deceptively acquire the business of the petitioner was demonstrated by the content of his letter of January 28, 2016, and the ongoing refusal of the plaintiff’s offer to completely satisfy all existing indebtedness secured by the involved promissory notes,” Harding writes. Harding lists reasons he believes the defendants undermined his contractual rights and business. He also says Johnson knew Harding wasn’t in default on the promissory notes. Harding says the defendants have intentionally harmed him and the business into which he has “invested years of time, finances and labor.” He says those actions have damaged him professionally and financially. Harding seeks judgment against the defendants for compensatory and punitive damages, interests, court costs and other relief. Earlier this year, the grandson of the founders of the Poca-based funeral home sued the current owners. J. Michael Gatens III filed his lawsuit Feb. 12 in Putnam Circuit Court claiming Harding owes him $113,000 on a promissory note as well as interest. Gatens – who lives in Calgary, Alberta – claims Harding also didn’t provide him with the deed to the property allegedly used as collateral for the loan. In August, Iowa-based Homesteaders Life Company filed a lawsuit claiming the funeral home falsely reported the deaths of 111 people who had signed up for pre-need funeral services and collected more than $900,000 from the insurance company. In their answer, the Hardings deny any wrongdoing and seek to have the complaint dismissed. But earlier this year, U.S. District Judge Chuck Chambers granted a motion to Homesteaders that would allow it to sell the property in question if it wins its lawsuit against Chad and Bobbie Harding. Earlier this spring, Homesteaders filed a motion seeking default judgment, claiming the funeral home and Harding are stonewalling. On May 3, U.S. Magistrate Judge Cheryl Eifert ordered the funeral home to pay $1,341 in attorney’s fees to the plaintiff for never responding to an April motion. In its original federal complaint, Homesteaders said it sells life insurance and annuity products, including life insurance policies to consumers entering into pre-need funeral contracts. In 2005, the companies entered into an agreement for the sale of pre-need contracts. For each enrollment, Chad Harding would be paid a commission, the complaint states. A similar agreement was signed again in 2007 with Chad Harding. Another similar agreement was signed in 2010 and again in 2012 for Chad Harding and additional employees of Gatens-Harding Funeral Home. Homesteaders paid commissions totaling $136,719.73 to Chad Harding and other funeral home employees for enrollments, according to the complaint. The funeral home also received an additional $14,667.23 override and bonus. Chad Harding received an additional $7,242.62. Homesteaders would release funds upon the death of a consumer who had signed up for a pre-need funeral contract. Beginning around September 2012, Chad Harding allegedly started filing false death claims with Homesteaders. He “engaged in a continuous pattern and practice of submitting materially false death claims to HLC, by telephone, and filling out and signing materially false bank drafts, wherein he fraudulently misrepresented that the … consumers had died … and that the contracted-for funeral services had been provided, when, in fact, said consumers were no deceased and said funeral services had not been provided,” according to the complaint. To these consumers who still are alive, Homesteaders says it has reinstituted the life insurance policies. Of the 111 people the funeral home claimed to be dead, 14 people did pass away after the funeral home claimed they had passed. Homesteaders accuses the defendants of fraud, violation of RICO laws for racketeering, conversion, breach of contract and unjust enrichment. It seeks compensatory damages, actual damages, special damages, punitive damages, attorney fees, court costs, pre-judgment interest and other relief. In September, West Virginia Attorney General Patrick Morrisey’s office filed its own lawsuit against the funeral home for violating the state’s Preneed Funeral Contracts Act. 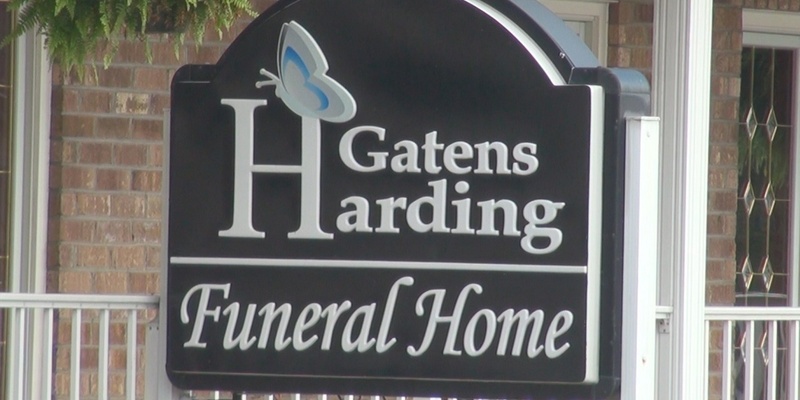 In that complaint, Morrisey’s office says Gatens-Harding Funeral Home and the Hardings misappropriated money from consumers who were trying to prepay their funeral costs and did not register some preneed funeral contracts with the state. The AG's complaint was for injunction and related relief, claiming the defendants have violated the West Virginia Consumer Credit and Protection Act and the state’s Preneed Funeral Contracts Act continuously since at least 2012. In his February complaint, Gatens was seeking compensatory damages for Harding’s breach and fraud, punitive damages for Harding’s fraud and misrepresentation, court costs, attorney fees, pre- and post-judgment interest and other relief. Gatens is being represented by Charleston attorney Joshua A. Johnson of Bowles Rice LLP. The funeral home and the Hardings are represented by Jeff C. Woods of The Law Office of Jeff C. Woods in Scott Depot.